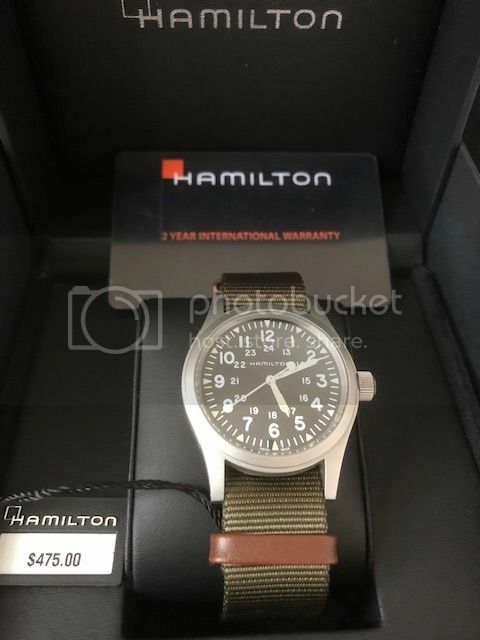 Up for sale is my Hamilton Khaki Field Mechanical watch. Purchased direct from Hodinkee, this piece recalls the great hand-wound military watches of the last century. The design reads "Hamilton" with simple 12- and 24-hour scales, luminous hands and markers, and a font recalling vintage military watches. The case has a nice weight to it despite the form factor of its 38mm diameter. The tough textile strap is suitable for all weather and conditions (the strap was never worn, as I had it on an after-market military strap). And it bears repeating that this watch comes with fully drilled lugs, making changing the strap a breeze.